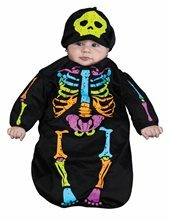 My First Halloween Kid Costume; My First Halloween Kid Costume includes: Onesie romper with candy corn and My 1st Halloween print on the front and attached triple layer, multi-color sheer tutu skirt, black leggings with candy corn detail and the ruffly headband. 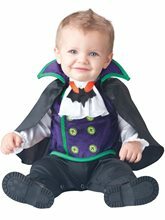 Baby's 1st Halloween costume. For 0-6 months and 6-12 months. 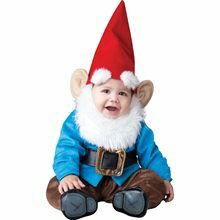 TOO CUTE TO SPOOK - Garden Gnome Infant Costume.Age Category - Infants.Brand - Too Cute To Spook.Character/Theme - Fairytale & Storybook, Nature.Includes - Jumpsuit, matching hat with detachable beard and booties.Available Size: Infant (12-18 Months).Material - Shirt: 100% Cotton, Pants: 100% Polyester (Exclusive of Decoration).Product Care - Do Not wash, do not bleach, do not tumble dry, spot clean with damp cloth, cool iron if needed, do not dry clean. 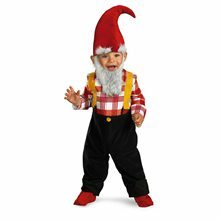 Too Cute To Spook Garden Gnome costume features red and white striped shirt with black overall jumpsuit, matching red hat with detachable white beard and red booties. 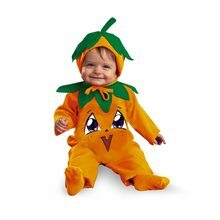 Tiny Treats® Lil' Punkin Pie costume includes orange bodysuit with printed pumpkin and matching bonnet.TINY TREATS - Lil' Punkin Pie.Age Category - Infants.Brand - Tiny Treats®Character/Theme - Classic Halloween.Product Includes - Bodysuit with printed pumpkin and bonnet.Available Size: Infant (12-18 Months). 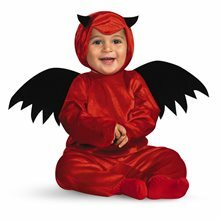 *Socks Not Included.Direction/Instructions - Large enough for toddler to wear outfit under.Attach fabric hood string to Velcro dot on headpiece. 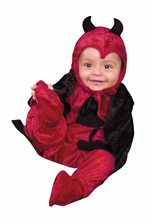 Tie both pieces of strings together to secure hood.Content - 100% Polyester./!\ CAUTION: Not to be used as sleepwear.© 2009 Disguise, Inc.